Free Promotion. #3 on Amazon Kindle for Historical. My American Eden outlines the sacrifice of a woman who defined the character of the new world when she said that without freedom, her life was not worth living. 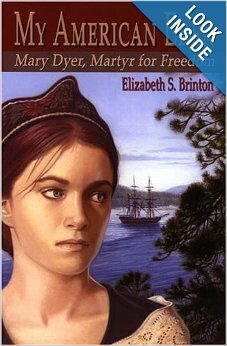 Elizabeth Brinton brings to life this historical figure who was hanged in 1660 because she would not bend to a government decree. Brinton’s evocative writing takes us to the hamlets of New England in the 17th century where we feel the snow and smell the fire. She captures with grace the gripping human story of a remarkable woman of faith who dared to challenge the dark side of an emerging America. 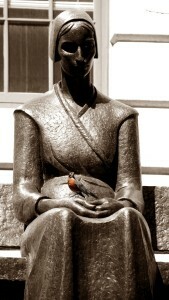 Mary Dyer makes you think…about the role of women in this world, about the evil that’s been done in God’s name, and whether the beauty and freedom of both will ever be fully realized. I appreciate that my daddy knows me well and gave me a copy of My American Eden, by Elizabeth S. Brinton, for Christmas. I admit that I have been so wrapped up in the English Reformation that I forgot that some of those feisty women sailed to America! With such a huge interest, I was shocked that I had not heard of Mary Dyer. I was eager to learn about her and Brinton did not disappoint. I quickly got sucked into the world of Boston, Massachusetts in the year 1635, and into the lives of the Dyer family as they arrived in the harbor. Brinton did a wonderful job of telling the story and painting the scene in my mind. She gave an accurate picture of what happened, as well as an unbiased opinion of the characters. I felt compassion for Mary, her husband, William, her children, her friend, Anne Hutchinson, and her servant, Irene who is the voice in the story. What is really interesting is how Brinton has the gift of making me crave lobster chowder and planted in me a desire to visit Newport, Rhode Island and Boston, Massachusetts. Now that is a good author! The more I read, the more I was compelled to research Mary and the facts surrounding her. I always know that I am reading a good historical fiction when I find myself saying, “Nuh uh!” out loud and looking it up, only to find that it is recorded in history. This gave me the confidence in Brinton as an author. I have read historical fictions that are so embellished that it completely loses its integrity as “historical.” I really appreciate how closely she stuck to the truth, while maintaining her creativity as a writer.